"Working with Maggie the students not only had the chance to try new techniques and learn new skills, they also worked with new materials and created extraordinary, original sculptures. " 'Sculpture' covers a great deal of techniques each with their own particular skills to learn, different materials and finished products, for example: clay modelling and moulding, wood and stone construction, metal, fibre-glass, concrete etc. 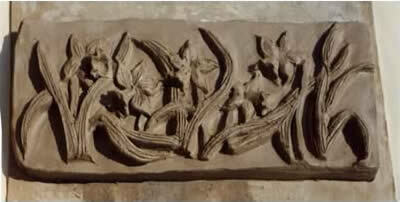 Plaster is a very versatile material as well as being easy to learn. 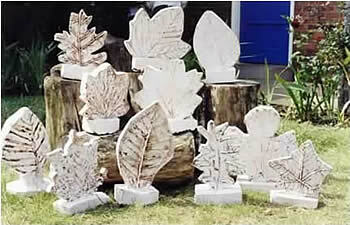 It can be poured into moulds to make shapes such as these leaves, (right), which are a students work from the Vauxhall Day Centre in Norwich. 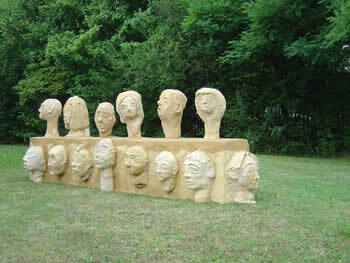 It can be mixed with other materials such as cloth, which can be manipulated and made into shapes but when dry becomes hard and solid (see the Sculpture Trail). 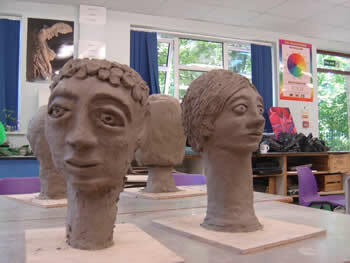 For most casting a mould has to be made first, this can be made from many materials but the most versatile and traditional material is clay (see the heads and the flowers below, and the Egyptian project).